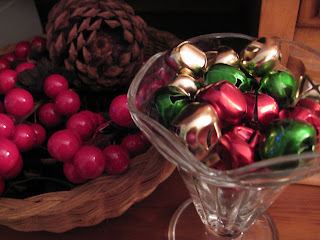 Kim's Kitchen Sink: Balls, Bells, and Dangly Things! Balls, Bells, and Dangly Things! As promised, pictures of the prettiness that is Holiday Cheer at Our Apartment (and yes, those are bells in a sundae glass). Yes, mom, there will be Chanukkah decorations too. Once I get them from you, because I am clearly so absentminded that I left them at home over Thanksgiving. That last sentence was more for everyone but my mom, since she is the one who reminded me that I left them at home. But I digress. I don't know. 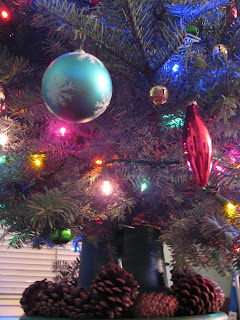 What I do know is that it is really fun to hang up lights and put shiny things on a tree. And when the time comes (in one week), we will celebrate Chanukkah, and I will be happy to have both the candlelight of the menorah and the twinkle of the Christmas tree lights to light up our little home. We do currently have a string of blue lights (solar powered! awesome!) lining the banister of the stairs that lead up to the apartment. I'll try to take a picture of those tonight. Or you can just use your imagination. Picture a staircase...with blue lights...going in a straight line...up the banister. Ooh! Seriously, they are pretty. And solar powered LED's are pretty much the best, most environmentally-friendly kind of lights you can use, right? So they were totally worth the $19.99 for 50 bulbs pricetag? I think so. They claim that they will last forever. And shine brightly even after a day of clouds. And adopt baby kittens and create world peace and stuff. Ok, maybe not that last bit. Anyway...what you've all been waiting for (I know, I know, the anticipation is killing you) - pictures! Lots of pictures! Sorry there are so many pictures! I just got excited! First, it is my pleasure to present: Le Tree Complete. 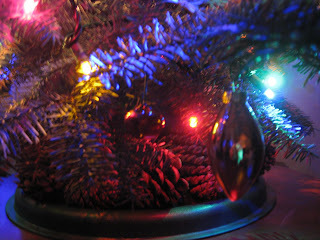 She is adorned with glittery balls in silver blue, red, gold and green ("lovin' would be easy if your colors were like my dreams"*), some dangly-icicle-pointy-shaped shiny things, and even some bells. Jingle bells, if you will. I think you will. A close up shot of the pine cones surrounding the base of the tree. They reflect our love of camping, hiking and nature in general. Oh, and they smell like cinnamon. 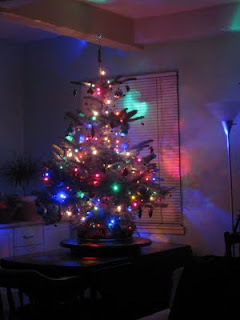 A less artistic shot, but the lights were on, so you can see a little more clearly. 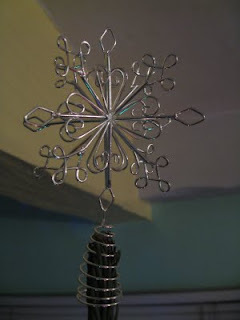 I loved these blue and silver snowflake ornaments. Kind of Chanukkah-ish, right? Snowflake tree topper. It's a little wonky, bounces around a little on its springy base, but it was cute. And non-denominational. 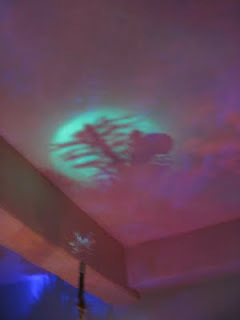 When the tree lights are on, it looks like there is a squirrel on the ceiling. Do you see him? 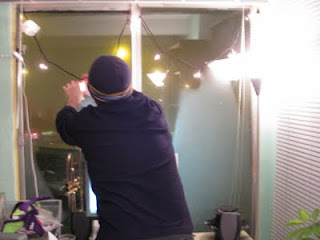 Will taking the Halloween topper things off the white bulbs hanging in the window. Bye bye to ghosts and jack-o-lanterns (I kept them up in November b/c the orange and white still felt appropriate. Somehow)! Another picture of the tree, with some of the lights on so you can fully appreciate the ornaments and the uneven wonkiness of the tree. 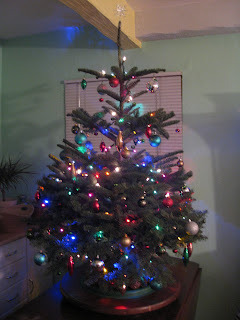 It's a little Charlie Brownish at the top, but as Emika said, that just makes the ornaments easier to see. I think it's adorable. The view out our front door. 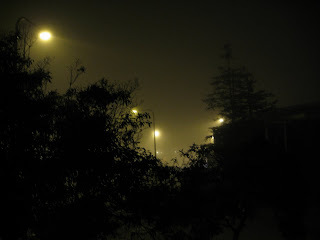 The fog really rolled in last night, and it was still there when we left this morning. Very misty, very cold. Very Decemberish. 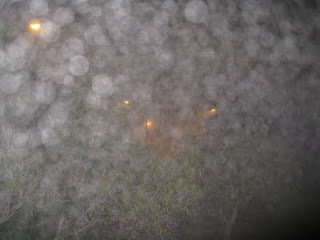 To give you an idea of how thick the fog was, this is what happened when I used the flash on my camera. Sorry to end this post with kind of a weird picture, but that's just the kind of gal I am. I have one more ornament to put up on the tree (the Minnesota Gophers snowman, complete with blinking light inside, that Will got me when he was in Minnesota for the Cal game), and Will's stocking is still in the garage...and oh yeah, there are a few more decorations still to put up around the house. But there's our tree, and some bonus "weather" pictures. So enjoy! And get in the spirit already! *Name that quote reference and I'll give you a prize. Or just be really pleased. "Jews in the house say whaaaat? "...I almost died. You kill me. However, I must disagree with the author. I just don't see what makes a lot of these menorahs so "modern." A lot of them look pretty traditional to me. However however, the author is correct that most Judaicas are RIDICulously expensive. You're inspiring me to put up my Christmas tree and decorations tomorrow!